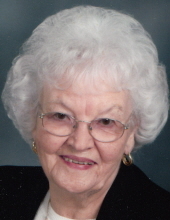 CARBONDALE – Hazel West, 97, of Carbondale, passed away on Monday, March 18, 2019 at Century Assisted Living in Carbondale. Hazel was born August 18, 1921 in De Soto to Marion and Nettie (Franklin) Hill. She married James D. West on May 4, 1940 in Cape Girardeau, MO. He preceded her in death on November 26, 1998. She is survived by her daughter, Sherri Hale and husband Terry of Carbondale; three grandchildren, Shawna Hale-LaDage, Lincoln Hale and Richard Hale; six great-grandchildren, William LaDage, Darren Hale, Taryn Qualm, Dylan Hale, Alli Hale and Kalyn Hale; five great-great grandchildren, Taytum, Kannin, Rylan, Addisyn and Kyler; niece, Carol Born of Little Rock, AR; nephew, Mark Hill of Franklin, TN; and sister-in-law Deanna Hill of Olive Branch. She is preceded in death by her parents; daughter, Brenda West; sister, Reba Counce; brother, Kenneth Hill; and nephew, Kent Hill. Hazel was a member of Mt. Calvary Lutheran Church in De Soto. She and her husband owned and operated West Bus Service for many years. Funeral services will be 11 a.m. on Tuesday, March 26, 2019 at Meredith Funeral Home, Carbondale with Rev. Melissa Waterman officiating. Burial will follow in De Soto City Cemetery. Visitation will be 10 to 11 a.m. on Tuesday at the funeral home. Memorials may be made to Mt. Calvary Lutheran Church and will be accepted at the funeral home. To send flowers or a remembrance gift to the family of Hazel West, please visit our Tribute Store. "Email Address" would like to share the life celebration of Hazel West. Click on the "link" to go to share a favorite memory or leave a condolence message for the family.